Boho chic is huge this summer and you can rock this inspired trend from day to office with these great finds. The top items to conquer this psychedelic trend are: jumpsuit, wedges, wide leg pants, boho dress. You will be surprised to see where I found some of these pieces for the season. The day dress is perfect for street festivals, weekend shopping or a mini stay-cation. Think Rachel Zoe in LA, where she is always seen wearing boho prints, wide leg jeans and over sized, square sunglasses. That is the look. You can take that feel and incorporate into your own style with these easy finds below. I love this one from J.Crew for $298. The hemline is perfect and modern but still has a very boho feel. You can wear this decade inspired look to the office too! wide leg trousers are back in, Pair them with a tucked in airy blouse and tall shoes to to modernize this look. These pants are a great choice by Robert Rodriguez on Cusp for $275. 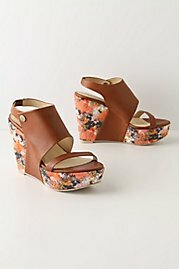 Pair these shoes and other day wear with these great colorful and leather block wedges found at Anthropologie for $190. 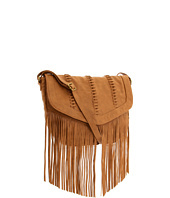 Pair any of these looks with this 70s inspired leather, fringe bag found at Aldo for $45. This across chest bag is perfect for a casual, laid back hippie look.